The Mr and I have season tickets to the San Diego State Aztec football games. Neither of us went there (both are Big Ten alums, from the time when the Big Ten knew how to count...) but we enjoy college football and have had tickets for nine years. San Diego State doesn't have the best football team. And the stands are generally not that full. But that means that the parking lot also has lots of space for tailgating! And that is one of our favorite parts of going to football games! We've had a lot of different tailgate meals... standard hamburgers and hot dogs. Philly cheesesteak sandwiches. Fajitas. Thanksgiving-themed dinner, with grilled turkey, stuffing, corn and pumpkin pie pudding. It poured rain that day, but only during the tailgate. Once, for my birthday, we had these amazing Delmonico steaks from Iowa Meat Farms. The Mr brought our china, silver and crystal. That was a wonderful tailgate! I like these kabobs for tailgating. They are already portioned, so no cutting, and more or less silverware free. And the flavors of the marinated beef with the sweet balsamic vinegar combined with the smoky bacon? Delicious! Mix all of the marinade ingredients in a gallon-sized Ziploc freezer bag. Add the cut London broil pieces. Seal the bag, and put into another freezer bag. (This is for safety, in case one bag breaks. Your refrigerator will thank you.) Refrigerate for at least 8 hours, or overnight. Thread the beef onto wooden skewers. 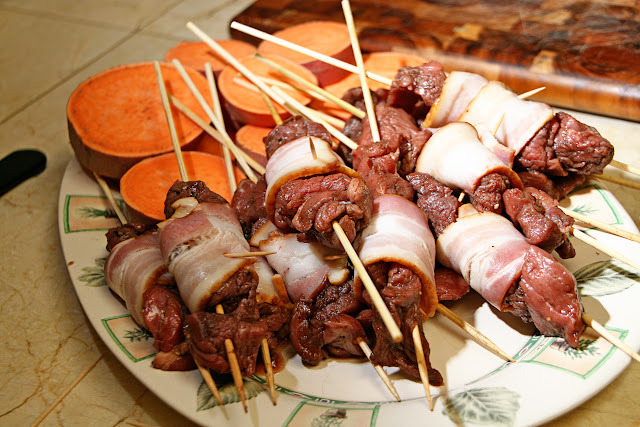 Use about 2 - 3 bites' worth on each skewer. Once all the beef has been kabobbed, it is time for bacon. In my mind, it is always time for bacon. Cut the bacon in half crosswise. 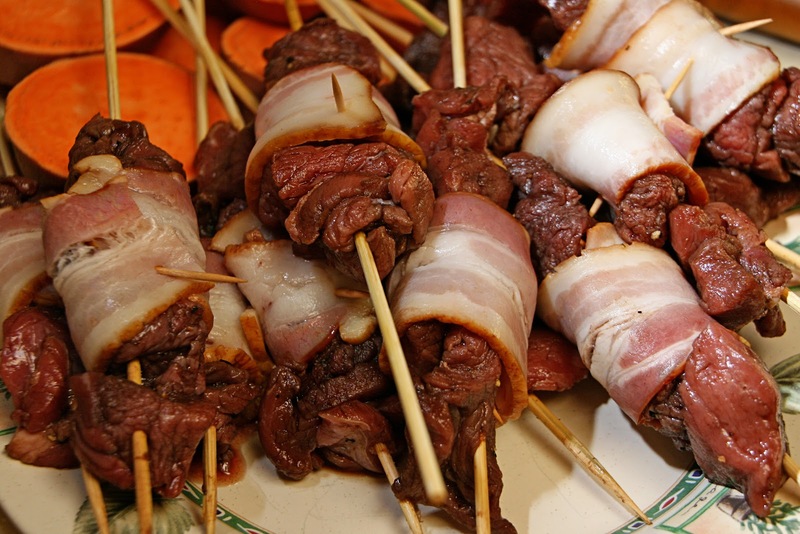 Wrap a piece of bacon around each kabob, securing with a toothpick. Can you see how I did it below? Do make sure to let everyone know to remove both the toothpick and the skewer. I like to grill these on the grill with indirect heat. That way the bacon does not get over-cooked, but the steak gets done enough. The pieces of steak are fairly small, so it does not take too long to grill, but grill until the bacon is crispy, but not burnt. As you can see in my photos, I also grilled slices of sweet potato that I coated in vegetable oil and lightly salted. What a great tailgate meal! Wow- these look great! I'm looking for a few great recipes to add to my hubby's surprise party eats. I think this might be on it. These look like so much more work than they actually are. I'm thinking of making them and keeping them warm in a crock pot turned on low for a large group. What a great idea! Stopped by from Wonderful Food Wednesday. Glad I found you!